From near to far and everywhere in between, the Summit iQ lenses, Summit cd iQ and Summit ecp iQ are designed to provide crisper, clearer viewing ranges and more natural vision transitions than any other traditional progressive lens. This new level of precision in traditional progressive lens design sharpens perspectives, and noticeably expands your viewing zones, no matter where you look. • Superior vision at all distances. • Allows more natural eye and head movements. • Sharp and wide in all zones. • Natural balance, distance to near. • Intelligent software optimizes the back surface. • cd iQ offers great performance in smaller lenses. • Wider fields of near, mid and far vision. • Summit cd iQ offers a 14 mm fitting height. • Images are not distorted by elliptical errors. • Designed with Hoya TrueForm™ Technology. • Point-by-point aspheric/atoric customized design. • Aberration correction along each line of sight. Summit cd iQ and Summit ecp iQ have revolutionized the standard progressive lens manufacturing process to produce a more intuitive design, resulting in much more vivid perspectives. The difference between looking through a Summit iQ lens and a traditionally made progressive lens is like seeing a Hi-definition screen after watching analog television. With TrueForm Technology, HOYA applies FreeForm Design principles to its existing semi-finished front surface premium progressive lens design. 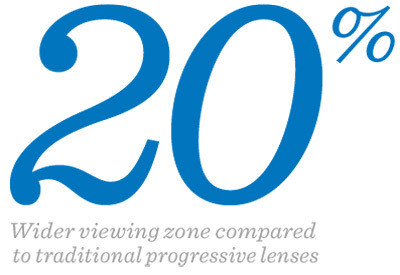 By applying additional aberration correction along each line of sight, supported by an aspheric/atoric back surface, the visual performance of the lens can be optimized over the entire lens for each individual prescription.